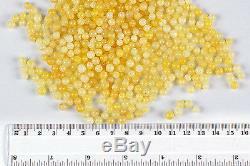 Natural Baltic Amber Beads Picture shows 50 grams of beads. In 50 grams there are about 400 - 500 beads. The diameter of beads is about 5 millimeters Baltic Amber is a 45-54 mill years old fossil resin from conifer trees, found at the Baltic coast. We sell genuine, authentic, real, natural Baltic Amber. 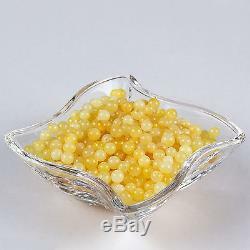 The item "Natural Baltic Amber Loose Polished Round Ball Butterscotch Color Beads 50g" is in sale since Thursday, May 21, 2015. This item is in the category "Jewelry & Watches\Loose Diamonds & Gemstones\Loose Gemstones\Amber". The seller is "evedamber" and is located in Ziegzdriai, Kaunas, Lt.